Not knowing much about Lebanon, I ventured to the school library to obtain some resources and, along with a book titled Lebanon Today, published in 1974 and therefore a titular oxymoron, I got an interesting story. The head library, a pleasant Egyptian woman, stopped me at the exit and asked me if I had an Israeli stamp in my passport. “No,” I replied, not entirely puzzled. I had just skimmed a brief section of the encyclopedia reminding me of the very prevalent existence of Hezbollah, the anti-Israeli organization permeating much of the country. “They wouldn’t let me in,” she continued. “They said, ‘You have visited the enemy.’ And I said, ‘What enemy? When?’ And they said, ‘You have been to Jerusalem. You have been with the enemy.’ They turned me around. I got on the same flight and came straight back. Stunned that the situation made use of the word ‘enemy’, I asked her when this was. Before reading up on the country, I knew very little. I knew that its flag bears a tree, but what kind or for what reason, I had no idea. I knew that I could wear shorts there without fear of getting harassed. When I asked Jamie for recommendations based on his trips there, he mentioned the nightlife and a big cave. So essentially, I was heading for a country in the Middle East that isn’t very Middle East at all (bare legs and a thriving nightlife, for two), that isn’t friends with Israel (although in the Middle East, who is? ), appears to bear some heavy American influence, and is home to a giant cave. Lebanon takes its name from the Semitic word laban, meaning white, christened because of its snowy mountain tops in the winter months. This was a fact I had to reread more than once. Sandwiched between Israel and Syria, two countries whose violent political clashes have recently landed them in international news headlines, I assumed that Lebanon was another hot climate culture, a dusty Middle Eastern country caught in the grips of armed extremists. Add to its location the fact that both Hezbollah and Hamas function within its borders and the fact that these very same borders have been admitting hundreds of Syrian and Palestinian refugees lately and you’ll understand why, on our way to the airport, I found myself questioning exactly why I had chosen Lebanon as my Eid destination this year. Before embarking, I did a little research in my limited library resources. In Modern Middle East Nations and Their Strategic Place in the World: Lebanon, a very accessible little book published in 2004 with the intent to educate Americans on the Middle East post-9/11, I was confronted with photos of dissembled landmines and gun-toting airplane hijackers circa 1985. Modern Internet research yielded even more of a disparity: there was Baalbek, site of ancient ruins that include a temple to wine-loving Bacchus, currently off limits to tourists due to its location in Hezbollah territory, and then there was Beirut, a lively city famed for its raucous and eclectic nightlife, which also honor Bacchus. Here is a country whose history dates back to 3000 BC in some places, like Byblos, the oldest city in the world that has remained continuously inhabited since its founding. This is a place that, much like its neighbors, finds itself in the Bible, its iconic cedar trees admired by prophets. That’s pretty impressive. 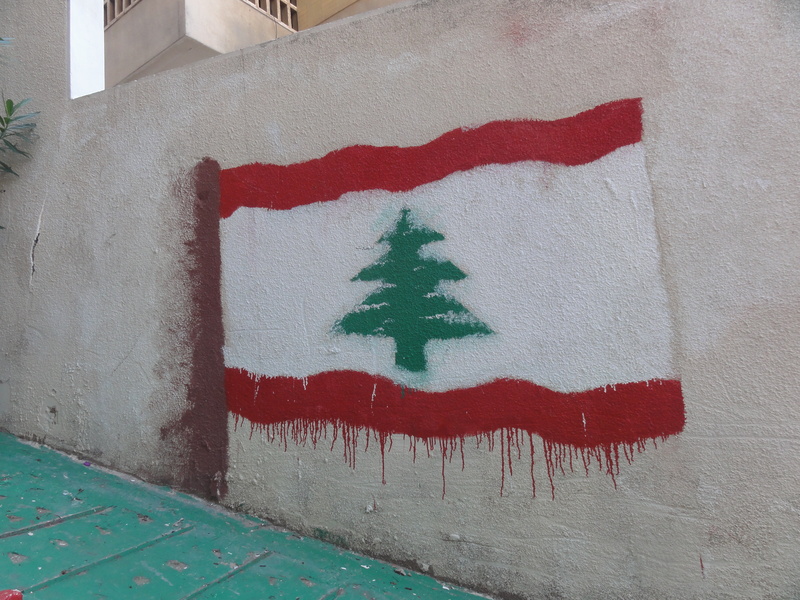 Lebanon is probably – and unfortunately – most well-known these days for its recent civil war; ending in the 90s, the war left Lebanon crippled and unstable, and the country is still piecing itself back together. Like Egypt, Lebanon has a lot on its plate with its own internal issues and the additional problems it faces daily because of its neighbors. Before its Civil War, Lebanon was known as the Paris of the Middle East, a hotspot for artists and poets and creative liberals. It boasted a rich history – Alexander the Great, Ramses II, and Nebuchadnezzar, to name a few, all of whom carved their names into a cliff as they entered the country – with a fairly diverse landscape: mountains, sea, and valley, all within a few hours’ journey from one another. Since its Civil War, it has become a place whose name sparks serious concern when you inform your family that you are traveling there. Despite all of this – and because of it – I joined Sally and Laina on their trip to see Loraine, whose new teaching job landed her in Beirut. This I was extremely excited about. Sally, my upbeat quarter-Egyptian friend who visited me in New Jersey this past summer, had not been to Lebanon before, and I imagined we would have quite a good time there. Laina, who spent the past year teaching in Jamaica before opting to return to Cairo, was someone I barely knew but who I felt was someone worth getting to know. Four days in Lebanon seemed as perfect an opportunity as any. We departed Cairo at 10:30 at night and were swiftly deposited onto Lebanese soil a little over an hour later, soaring in over inky sea ringed by twinkling mountains. Upon arrival, 12:45 AM Lebanese time, we found ourselves fresher than anticipated and in equally unanticipated short lines at passport control. My passport has come to resemble Frankenstein’s monster these days, with nearly 90 pages straining the frail binding, and I was excited to add another stamp. 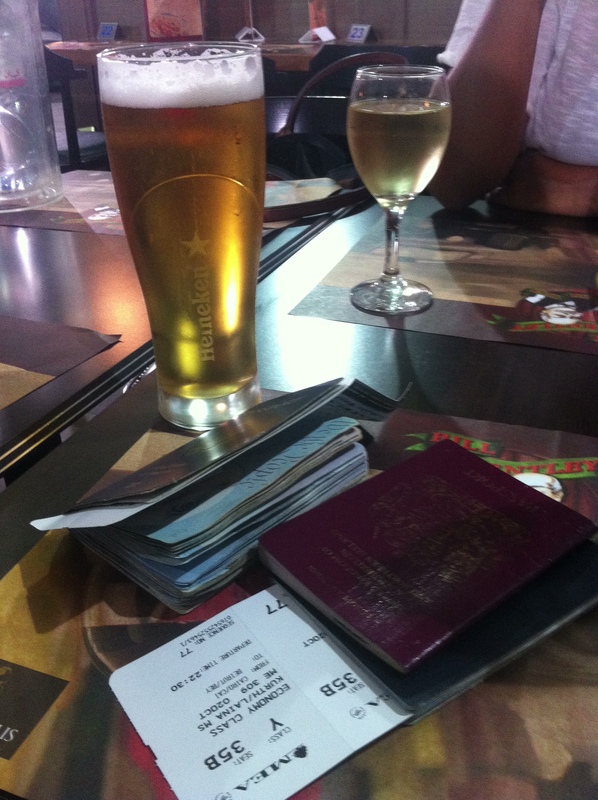 Eager to get in, I greeted the customs officer brightly and watched as he perused the passport. I replied that no, I had not, to which he raised his eyebrow skeptically. Had our librarian not mentioned it, I might have felt a bit more unsettled, but her anecdote had aptly prepared me for the mini-interrogation, and I glided through to the luggage carousel. Once through – with a bottle of Duty Free vodka in tow, courtesy of Sally – we found a very tired Loraine waiting at the gate to shuttle us back to the hotel where the school has put her up until apartments are completed. I’d like to say we rallied and ended our first night by strolling through the door in the wee morning hours, but we were all tired, and more than anything, I was excited to see what Beirut had to offer the next day.